During the late summer and fall of 2017, BAI began work on deepening the USCG Training Center’s boat basin in Yorktown Virginia, as well as realigning their approach channel to avoid a recently discovered historically significant area that bisected the former channel. This unique project required removal of both silty and sandy material via hydraulic methods due to an unusually narrow navigable channel width of 30′. 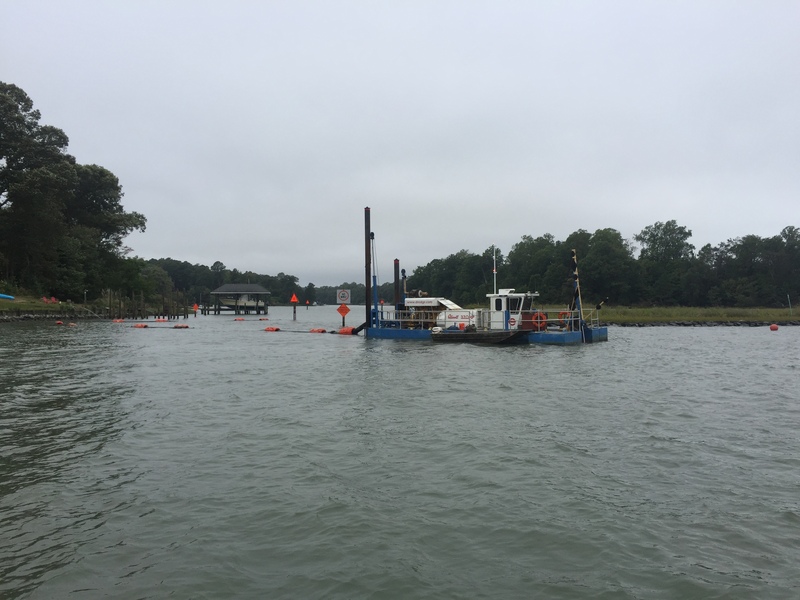 Sandy material was pumped via conventional methods to a beach placement area on USCG property on the bank of the York River. Material deemed too silty for beach placement was pumped into scow THOMAS DESMOND and was transported to the Wolftrap Offshore Disposal site once material had sufficiently settled out of suspension. This project was completed with assistance from PCI Dredging of Wisconsin, whose expertise in hydraulic dredging methods proved invaluable to completion of this project. Channel realignment, ATON replacement, and boat basin deepening was completed ahead of schedule and under budget by December of 2017.